The 2008 breeding bird survey results proved to be the rather typical mixture of gains and losses. This was the first survey to cover every breeding species in the Eakring and Kersall area since 1998 and in certain instances, the survey has gone very much against the national trend of decline in the fortunes of several species, whilst it has highlighted a decline in more unexpected species. Once again, particular attention was made regarding threatened farmland species, but it pleasing that several still continue to do well. As in the case of our previous Eakring surveys, meticulous care was taken to record, check and re-check the number of breeding pairs present, particularly in difficult areas to count such as the many private gardens around Eakring village. We also sought access to the area's farms and associated outbuildings and private residences, which allowed even greater coverage and more accurate counts than attained in 1998. This proved to be a wise move and resulted in many more Swallow pairs being noted than was previously thought, or had been counted during earlier surveys. A number of new houses at Eakring, has resulted in some loss of breeding habitat and Swallows were thought to have been one of the most likely species to suffer through a series of recent barn conversions, but a more thorough survey this year, with improved access to nesting areas, resulted in a very surprising 21 pairs being recorded. There had obviously been a considerable underestimate of the Swallow population in previous surveys. Both under and over-estimating the number of breeding pairs is always a problem in any survey and at first glance, some counts may seem hugely exaggerated and certainly the large rises in some populations on the 1998 survey results may indicate this. However, with an extension to the recording area boundaries in 2000, direct comparisons with the original 1998 survey are more or less meaningless, unless comparing particular sites such as Eakring Flash or Eakring Meadows etc. Two birds which have showed complete contrasts in fortunes over the years are Blackbird and Willow Warbler. Willow Warbler showed the largest drop in breeding pairs during 2008, compared to when they were last surveyed in 2001 and is the only warbler to have shown such a drop. At the time this seemed surprising as much of Sherwood Forest and other sites visited, seemed full of them this year and the same amount of habitat has remained at Eakring for years now and has even increased with scrub and vegetation growth at Eakring Flash. 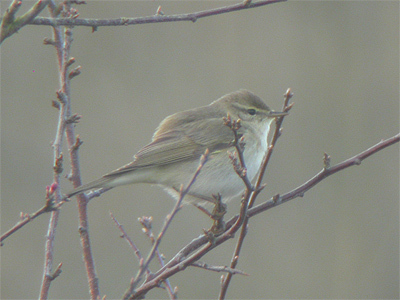 However, when the number of Willow Warblers recorded in April and May of each year is looked at, then this drop should not have been at all surprising, as the numbers of both Spring migrants and breeding pairs had actually dropped considerably in 2004 and had never recovered or been noticed in the years to 2008. Between 1998 and 2003, the number of breeding pairs ranged from a minimum of 37 in 1999 to approximately 50 in 2001. Even in 2003 there were still 49 pairs around the area, but since 2004, numbers practically halved and have continued to drop to reach a low of just eight pairs in 2008. Interestingly, the drop in Willow Warblers has coincided with the drop in Cuckoo numbers at Eakring. Cuckoo has not bred (or males even held territory here) for any length of time since 2003 and there was'nt a single record in 2008. 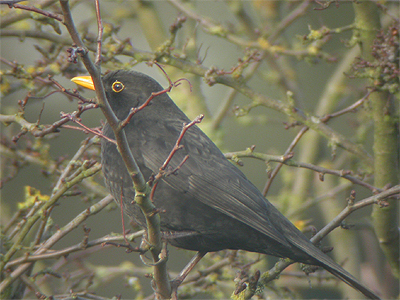 Blackbird numbers have risen enormously over the years at Eakring, so much so that the 2008 population of 163 pairs must be nearing the maximum breeding population the entire area can support. Whether recent new housing developments throughout the village will affect numbers during future surveys, remains to be seen. The table below shows the various results from breeding surveys at Eakring since 1998. Over the years, a number of specific species' have been surveyed and these counts are shown in the various columns. The R/F (rise or fall) column compares the 2008 counts to either the 1998 breeding bird survey or a species' most recent survey. For some this is as recently as 2007 or 2004. Where P appears in any of the columns, this represents the species as being present, but actual breeding not confirmed. Note:- Pheasant has not been included due to the annual release of birds. When the survey results are broken down into various categories, it reveals that 37 species showed rises in pair numbers on the previous survey, 17 species were down from the previous survey, 11 species showed no change from the previous survey and five species were known to have been present in the area, but breeding failed or was not proven. This latter group included Tufted Duck and Shelduck, but it is interesting to note that the number of breeding wildfowl at Eakring and Kersall has dropped considerably over the past few years, and both Mallard and Gadwall numbers have continued to drop from their highest breeding levels reached back in 2004. It is fair to say that poor weather has severely affected breeding successes of both species in 2007 and again in 2008, when first broods were lost and breeding success was dependent on second brood production. Both Coot and Moorhen suffered the same way and even second broods were almost entirely lost, but both species showed very small rises in pair numbers on previous surveys. Wildfowl numbers at Eakring in general, have continued to drop over the past few years and show no sign of increasing. It is pleasing to report on what is a relatively successful breeding survey/season. Expectations were, that many more species would have shown a decline since previous surveys, but that has not been the case. Many of the species which showed no change on previous results either continue to be restricted through large territory requirements, or limited by the availability of suitable habitat. Despite the fact that on the whole, much of the area's available habitat has changed relatively little since 1998, there have been genuine breeding pair increases. Dunnock, Robin, Blackbird and Chaffinch have all showed very large increases in numbers, but already had existing healthy populations in 1998. 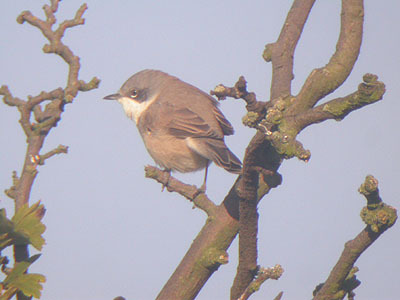 On the other hand, Lesser Whitethroat has probably shown one of the most prolific increases which began back in 2004. After just one pair was found in 1998, numbers have slowly risen to an exceptional 11 pairs in 2008. Whitethroat has always been common here, with pairs numbering virtually the same as in 1998, but have increased on a poor year in 2004 when there were just 28 pairs. Warbler counts on the whole have tended to vary from year to year/survey to survey, but this can be expected to happen occasionally with species having to cover large distances in order to reach their breeding grounds. However, I can find no relationship between a low number of Spring migrants and a low number of breeding pairs per species in any year. A poor year for Whitethroat in 2004 was not mirrored by other warblers, but each species certainly does have poor years. For example, Chiffchaff numbers dropped considerably in 1999, to half of what were recorded in 1998, but there has again been a steady and sustained increase, and in 2008 some 32 pairs bred. Certain species are extremely reliant on human habitation for nesting and territories and many are in national decline. Four of the six species selected here do show evidence of population decline at Eakring, although Pied Wagtail, House Sparrow and Starling have done so only relatively recently. House Sparrow Passer domesticus --- Down by eight pairs on the survey conducted in 2002, but still a relatively stable population since 1998. Starling Sturnus vulgaris --- Down by five pairs on 2007 survey, with the population having remained stable since 1998. Swallow Hirundo rustica --- Dramatic increase through a greater access to private sites/dwellings in the 2008 survey. The actual status of Swallow in the area, has probably changed little since 1998. House Martin Delichon urbica --- Rise of three pairs on 2004 survey results, despite several nests being unnoccupied through building work at one Eakring house during breeding season in 2008. Spotted Flycatcher Muscicapa striata --- Just one pair recorded since four were found in the 1998 survey. Nested in the same wall as in 2007. Pied Wagtail Motacilla alba yarrelli --- Unexpectedly down by three pairs on 2004 results. In the three breeding bird surveys from 1998-2000, House Sparrow produced 73 pairs each time. This rose to 75 when the species was last surveyed in 2004, but has produced a fall of eight pairs in the intervening years to 2008. Starling numbers had also been remarkably consistant over the years, but 2008 saw a drop of five pairs from 2004 and likewise, Pied Wagtail were down by three pairs. Both former mentioned species are likely to continue to decline in numbers. Modern building regulations are much more restrictive than they were formerly, and barn conversions do have a detrimental effect on the number of breeding birds. It seems that in the future (with no let-up in the amount of new builds/conversions within Eakring) Swallow numbers will also start to decline, despite a much healthier population than originally thought before the survey. Spotted Flycatcher remained at just one pair, which again returned and bred successfully at the same site in Eakring as was used in 2007 and remains one of the area's most threatened breeding birds. It is fair to say that some farming practices and methods have changed here since 1998 (mostly from government backed initiatives) and which may be the reason why the 2008 survey has some positives to report on. Nine typical farmland species are featured in the table below, the populations of which are generally indicative of the affects of modern farming practices. Overall the signs are encouraging, but Turtle Dove still remains perilously close to disappearing as a breeding bird at Eakring. Again, Turtle Doves were found at just two Eakring village sites. On the plus side, two pairs does represent a 100% increase on the 2007 breeding population. Grey Partridge Perdix perdix --- Up by one pair on 2007 results, with a continued rise in numbers since 2004. Lapwing Vanellus vanellus --- Up by ten pair in 2008 from 2007 but remains a sporadically breeding species here and completely reliant on the availability of suitable nesting habitat. Turtle Dove Streptopelia turtur --- Up by one pair on 2007 survey results, but remains down on 1998 survey results and severely threatened. Barn Owl Tyto alba alba --- Increase of one pair in 2008 after first returned to breed at Eakring in 2005. Both nesting in artificial nest boxes. Sky Lark Alauda arvensis --- Has continued to increase each year snce 1998 and was up by 19 pairs on 2004 results. Tree Sparrow Passer montanus --- Up by two pairs on 2007 survey and may be slightly under recorded. Has maintained a gradual increase in breeding numbers since 2003. Bullfinch Pyrrhula pryyhula --- Up by five pairs on 2004. Linnet Carduelis cannabina Down by two pairs on 1998 figures. Yellowhammer Emberiza citrinella --- Up by one pair on 2002 and by eight pair on 1998, with the breeding population remaining fairly static. Turtle Dove is just one species that was once so typical of the UK's farmland and many words have been written about the local/national decline in farmland birds on this website before. There is good news and a more positive outlook for most of the other selected species though. Grey Partridge pairs continue to (and maintain) the increase which first began after just a single pair bred in 2004. Grey Partridge are not released for shooting purposes at Eakring and so the increase to seven pairs in 2008 is purely a natural one. No doubt, this species has been helped by the set-aside strip scheme, which was eventually taken up by all of the farms with land in the recording area. Tree Sparrow may also have benefitted the same way, with an increase of two pairs on 2007 figures. In conjunction with a breeding pair increase, post-breeding and wintering Tree Sparrow flocks have also increased. Sky Lark continued to produce record numbers of breeding pairs in what has really been an astonishing comeback from just ten pairs in 1998, to 50 pairs in 2008. The spread has generally been an eastwards one and began before set-aside strips surrounded many fields. Set-aside strips containing mostly grass have been well utilised by hunting Barn Owls, but their returning to breed at Eakring and Kersall, has been through the siting of three artificial nest boxes. With one pair first appearing in 2005 and breeding each year since, a second pair were found using a box in the west of the recording area. A third box near Kersall appeared to remain unused during 2008. 2008 turned out to be a record year for Lapwing, with 16 pairs breeding in the Park Farm area. Many pairs nested on newly created grass areas, but nesting was by no means confined to areas such as this. Bullfinch was another species which showed an increase and were up by five pairs on 2004 results. 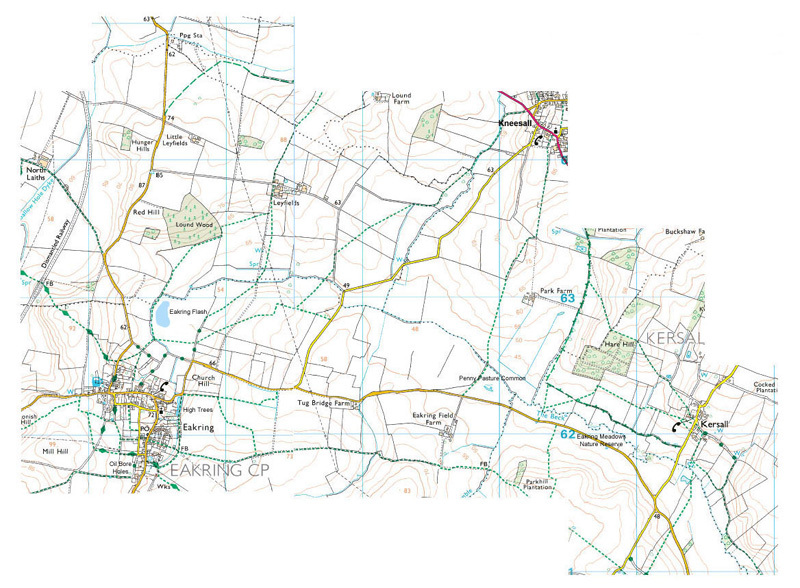 Pairs were generally at well scattered locations throughout the Eakring village and Eakring Meadows areas. Yellowhammer were up by one pair on 2002 survey results, but by eight on those found in 1998. Yellowhammer and Linnet have both preferred hedgerow habitats for nesting, but in a similar situation to both Whitethroat and Lesser Whitethroat, regularly maintained hedgerows are favoured. The few examples of ancient and uncut hedgerows in the area, are considerably less well used as nesting sites.